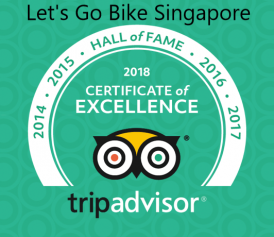 Historical Singapore - Let's Go Bike Singapore! A Mosque, Indian and Chinese temples on the same street?! Right here in Chinatown! Understand Singapore’s diverse cultures and see how the various religions live in harmony. It would not be wrong to say that everything about Singapore started from this river. Once filthy and crowded with squatters, it is now clean and boasts some of the priciest real estate in town. The numerous eateries and bars that dot the promenade come alive when night falls. The Malays are the original inhabitants of Singapore and no other place reflects this better than Kampong Glam. Be awed by Sultan Mosque and explore the quaint little streets around it! Philatelic, Peranakan, National & Art Museums are all in the vicinity. The Singapore Management University (SMU) was established in 2000 and is the first and only public university in the city area. This area holds the WW2 memorial for civilians. It is also near the iconic RaffIes Hotel and part of the route for the Singapore Formula 1 night race. Making waves is the Marina Bay, the hippest place to see and be seen. The Esplanade is Singapore’s world-class performing arts theatre and concert hall. Or affectionately known as ‘durian’ to locals! The Merlion is a mythical creature with the head of a lion and the body of a fish, used as a tourism mascot and national personification of Singapore. Look out for the Supreme Court and Singapore’s Parliament House. A statue of Sir Stamford Raffles, founder of modern Singapore in 1819, is found here. The only place in Singapore where you are allowed to hold public rallies, speeches and protests; right next to a Police Station! Discover the REAL Singapore on our Historical Singapore route. Visit a typical residential town and watch the people go about their daily lives. Check out a market frequented by locals. Eat like a Singaporean; sample local snacks and drinks at a ‘coffeeshop’. See old and new HDB (public housing), as well as multi-million dollar riverfront ones. We meander alongside the Singapore River – where trade brought life to the sleepy village town in the 1800s. See historically important landmarks, such as a 100-year old fire station, museums, and places of worship. Of course we’ll pay homage to the statue of Sir Stamford Thomas Raffles, founder of modern Singapore. Learn how the 2nd World War affected Singapore and see monuments in honour of the many who suffered. Understand the melting pot of people from all over the world living here. Fast forward to the present and be awed by the ultra modern business district. Be right in the action as we cycle right along part of the Formula 1 route (sorry the bikes can’t go 300km/h though). What are you waiting for? Join us to Discover Singapore the RIDE way!